By the time round 3 started it was 5PM and we had already been awake for 12 hours. Who said that wargaming isn’t an endurance sport? Luckily, we got to face the friendliest guys ever: Team Hambo’s from the Netherlands. 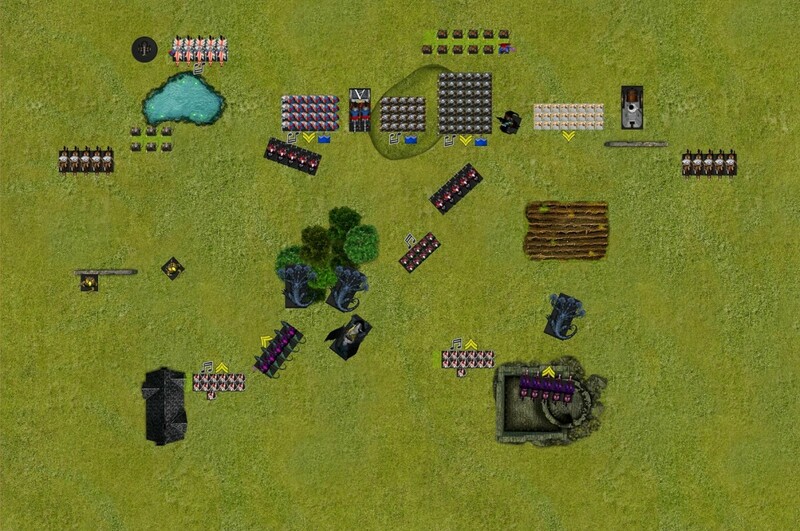 My opponent was to be Bas @bas_2312 with his wonderful Halfling Empire army. I’d admired his models online before, and some of you may have also seen his gaming club’s Minihammer exploits, too. 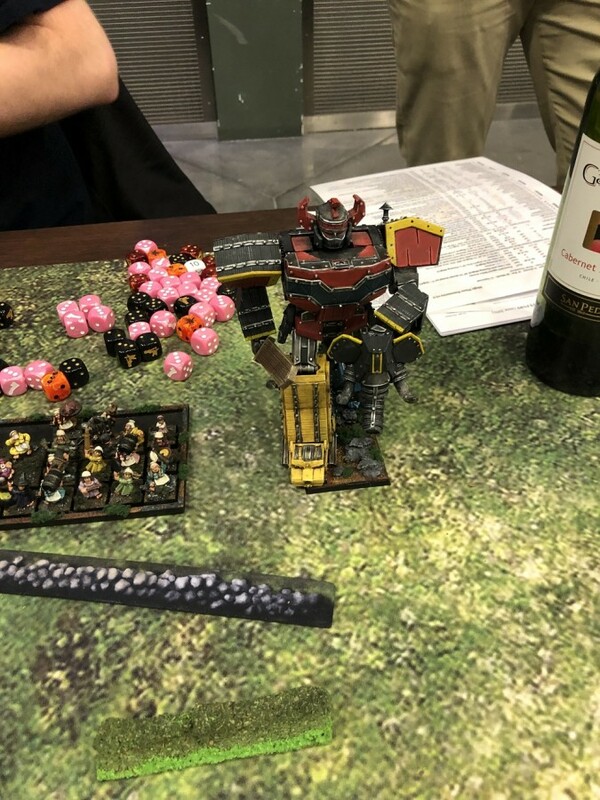 Here’s a link to his Instagram, where you will find among other stuff his take on the Steam Tank: a giant morphin’ robot! So a good mix of magic/shooting and staying combat power, along with good scoring. A good recipe for a challenging fight! 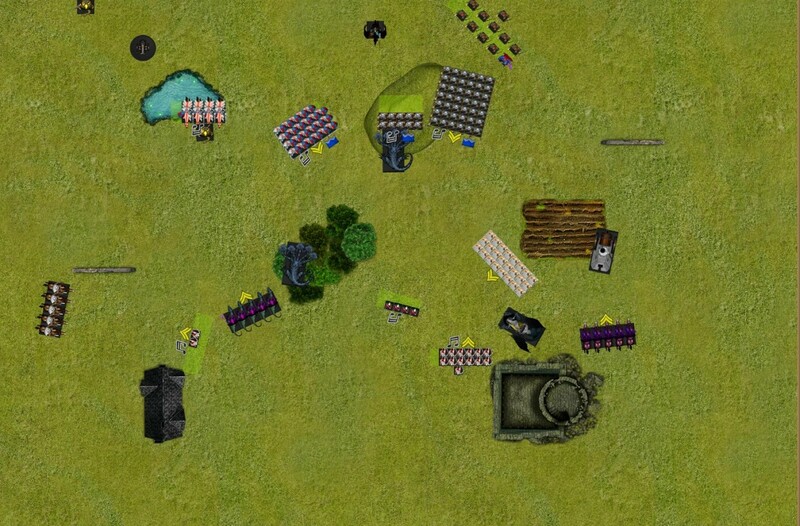 This round the scenario was Spoils of War, and the deployment type was once again Marching Columns. My adversary won the roll for sides and picked the side with the hill and the least amount of blocking terrain. This meant that I could grab first turn though, always welcome against a list with considerable shooting power. For spells I went with the usual Ice and Fire/Crippling Fatigue and Grave Calls/Breath of Corruption combo, while the pyro wizard got Fireball, Pyroclastic Flow and the Flaming Swords. 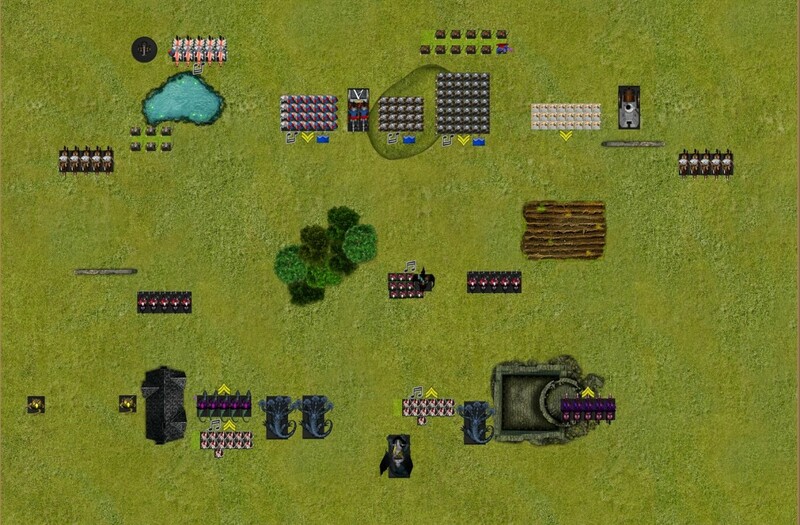 Going into the game I decided that I’d keep my scoring units near the center, use the fast elements to control the flanks and ram the imperial battle line with my monsters. If all went according to plan, it would create enough of a diversion for the small scorers to grab the loot and run with it! First turns in such games are all about controlling battlefield space, and this one was no different: the medusae pushed forward to threaten the mortar and prevent the cavalry from outflanking me. To the right, the yema acolytes and a single kraken would try to keep the Steam Tank, Flagellants and Reiters honest. The Pegasus Prince saw an opening between the Flagellants and the Halberdiers and used his movement to land there, threatening the Arcane Engine and potentially the Handgunners. Finally, the two kraken pushed forward using the forest as cover. 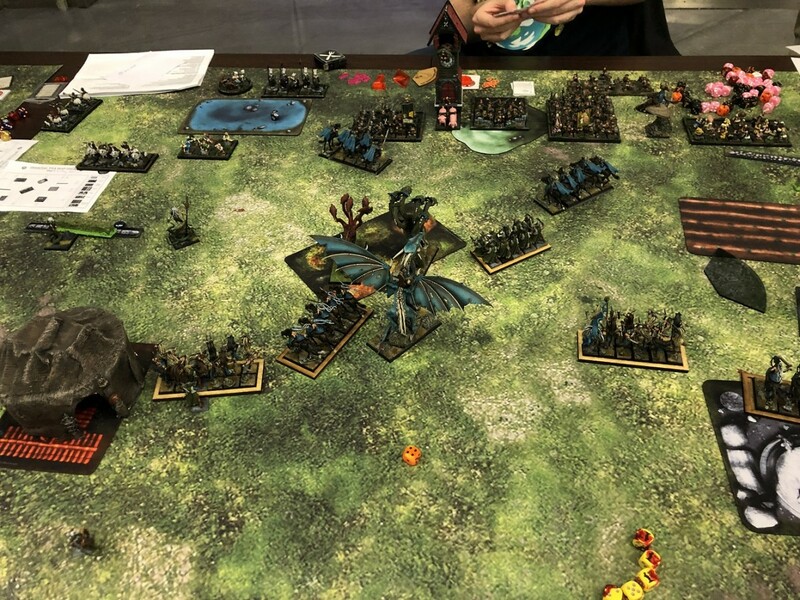 To avoid the Halberds/Imperial guard charging headlong into my monsters, I had to sacrifice my Dark Raiders: while infantry is not a bad target for stomping krakens, you want to be charging and not the other way around! In the magic phase the Breath of Corruption went off, killing four Reiters from the rightmost unit, but the last survivor didn’t panic. The halfling didn’t take the bait, and elected to maneuver instead of charging into the dark raiders. 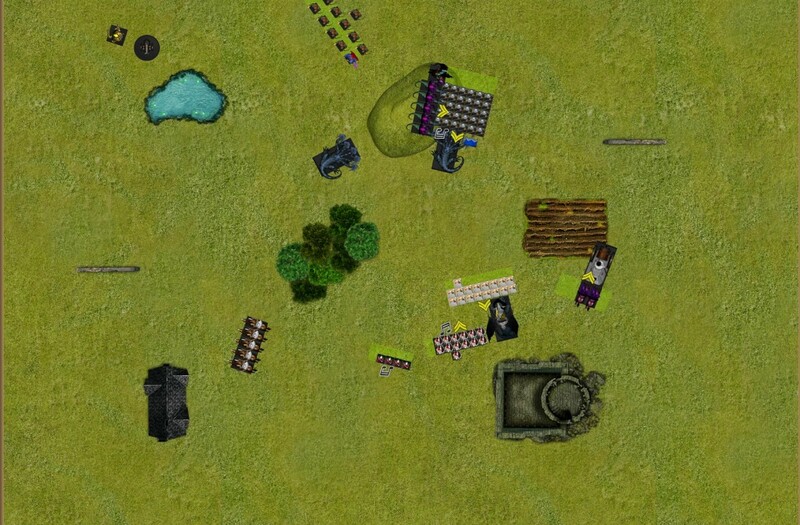 The steam tank moved up slowly, and the two reiter units pushed forward to open fire against my fast support. Magic started with a miscast Flaming Swords on the Handgunners: the result of the miscast being Amnesia, I elected to let it through so as to get rid of the spell. A small fireball killed three of the right Dark Raiders and put a wound with Blaze on the paired weapon Medusa. 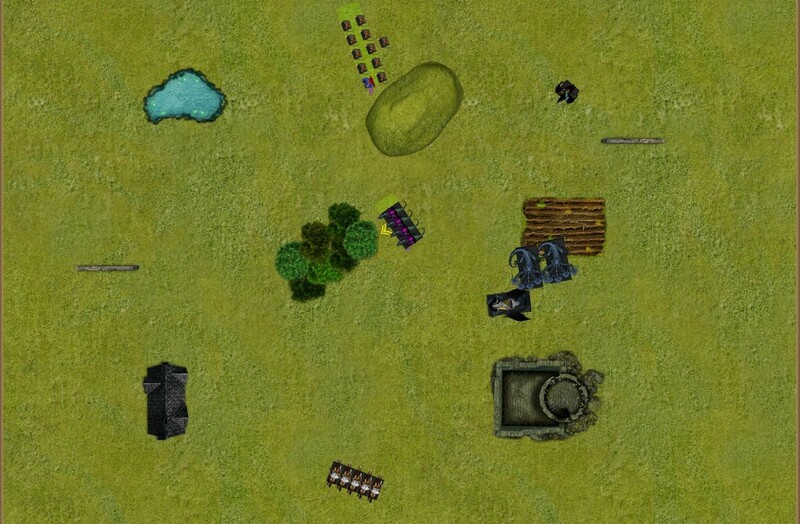 Shooting started with a volley from the left reiters that put another wound on the Medusa, while to the right the Steam Tank and the lone Reiter failed to wound the kraken. 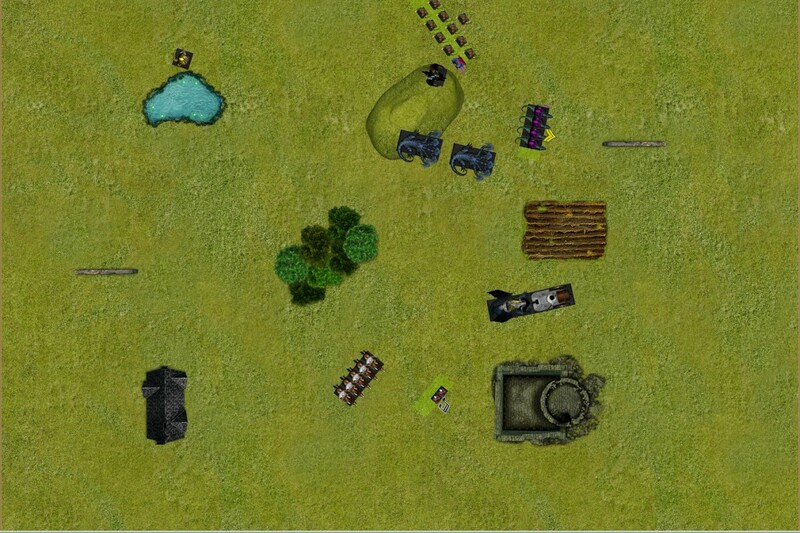 The Mortar hit my corsairs killing six of them and the Handgunners couldn’t hit the Kraken thanks to the forest’s cover. The bulk of the army charged: the middle Kraken went into the Handgunners, its mate failing to charge into the Imperial Guard. The wounded medusa charged into the Imperial Rangers and the second one fell upon the Electoral Cavalry inside the water feature. The Pegasus Prince charged the Arcane Engine, and the left Blades of Nabh went for the Reiters but failed. Finally, the Kraken to the right charged into the Steam Tank, and the Acolytes of Yema right behind took advantage of that to charge into the lone surviving Reiter. 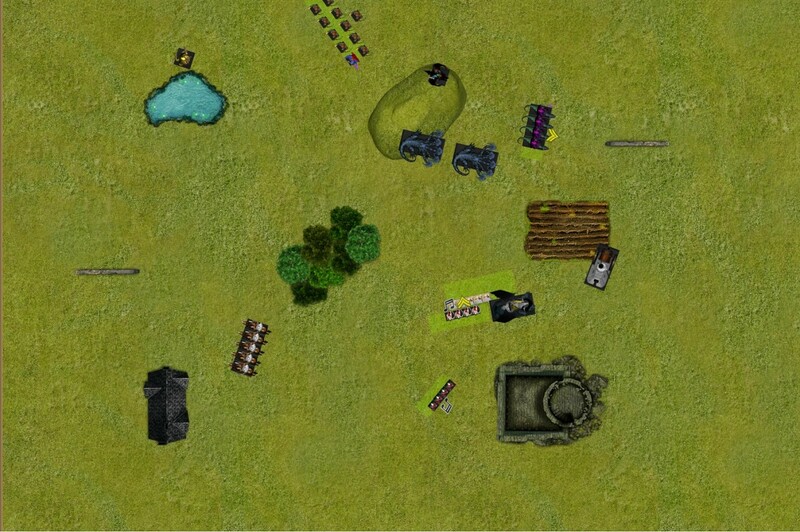 The corsairs now picked up the middle Spoils of War token and started their way back into my deployment zone. The Manticore maneuvered in a position where it would grant the Beastmaster rerolls to the kraken fighting the Steam Tank. 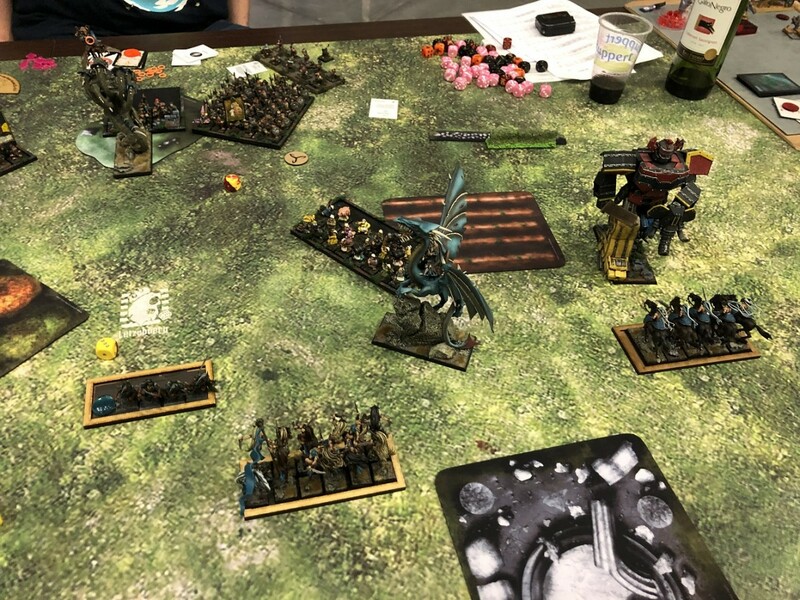 The depleted dark raider unit stepped in front of the Flagellants to direct them away from said manticore, but while fiddling around with positioning I actually repositioned the manticore right into the flagellants’ overrun path! Oops! Magic was pretty uneventful this turn, the only thing that got cast was a bound Deceptive Glamour, allowing me to lower the halberds’ movement by one. 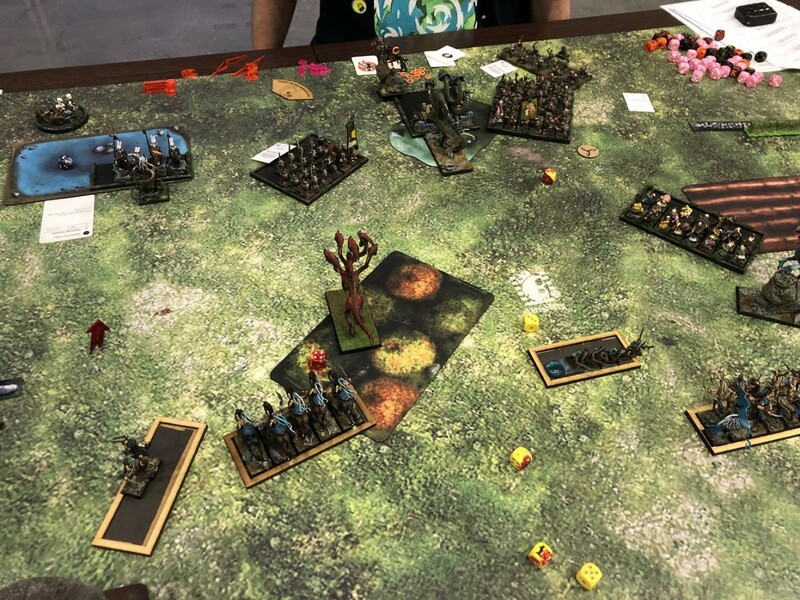 Combats generally went well for the Dread Elves: the medusa made short work of the Rangers and pursued them off the table, the second medusa killed a knight but they held their ground. The Prince killed the Arcane Engine ridding me of that distracting bubble. The Kraken stomped some Handgunners but took a wound from their attacks; they held their ground thanks to the minimized leadership order. Then came the Steam Tank fight: aided by the Beastmaster’s ability, the Kraken dealt three wounds to the Tank. My opponent promptly made 3 5+ saves, and then got 6 grinding attacks. Five of them wounded, I failed to save and the kraken died for nothing! The Yema Acolytes predictably killed the lone reiter champion, but now the situation of that flank was looking dire.. 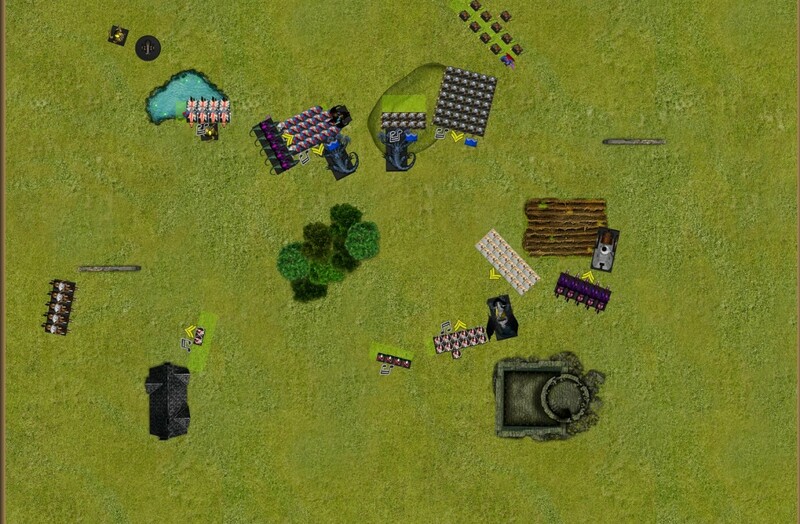 The counterattack was sounded: the Flagellants fell upon the dark raiders, with a 9+ overrun into my manticore’s flank. The Imperial Guard charged the other fast cavalry unit, and the Steam Tank set course for the Yema Acolytes but thankfully fell a couple of inches short! In magic and shooting the Prince took both Fireballs but saved all of the hits thanks to his 1+/3++. This allowed me to dispel the buffs on the Flagellants, preparing for the upcoming fight. 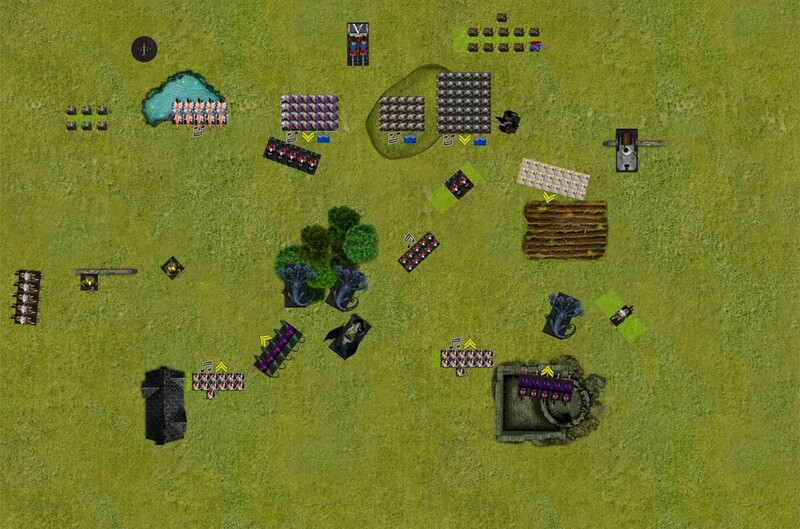 Shooting was less eventful this time: the Mortar misfired and wouldn’t be able to fire in the following turn, but the Reiters made up for it by killing 7 blades from the rightmost unit. In combat the kraken continued its fight against the handgunners, but they remained steadfast and held their ground. The flagellants easily dealt with the redirectors and I watched with baited breath as my opponent rolled his overrun: an 8! The manticore was safe, and the religious fanatics stopped their move 1” away from it. 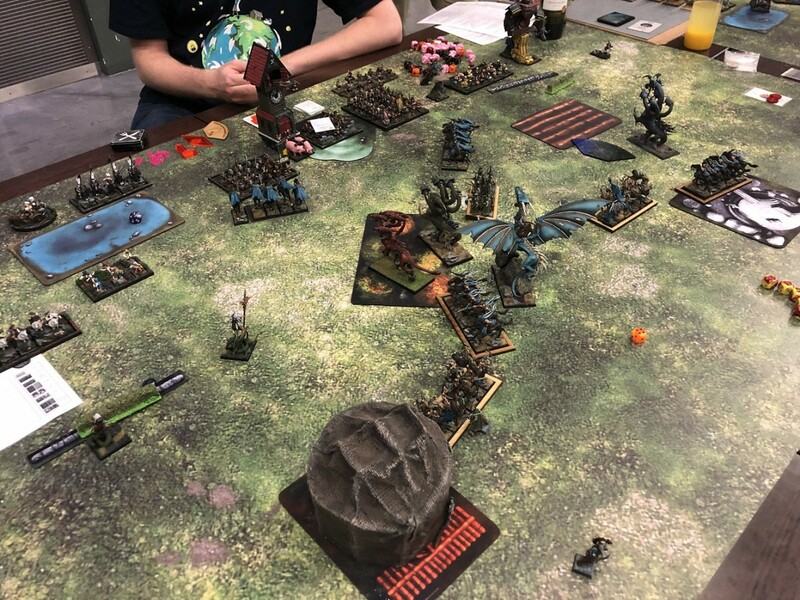 The Medusa/knight fight was a stalemate, and the imperial guard easily killed the elven cavalry, but not before losing their champion to a horse’s attack! 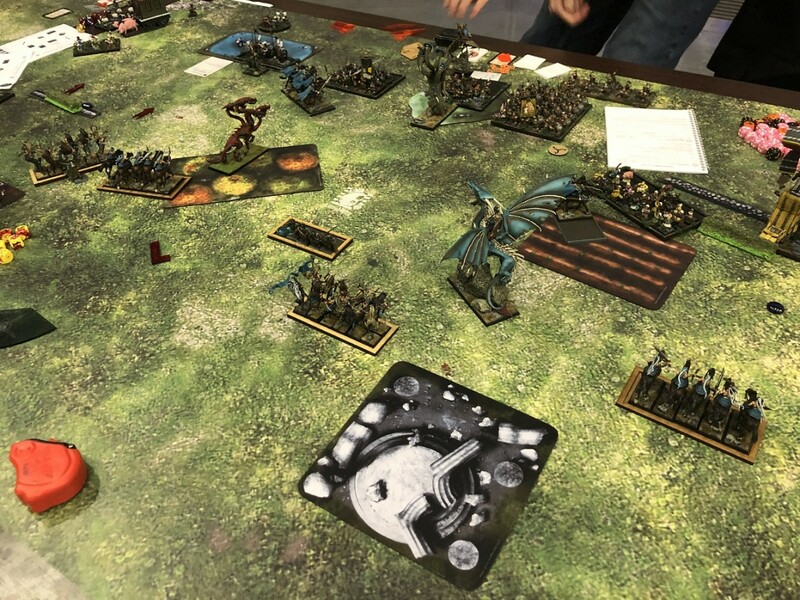 The elven forces piled on: the Imperial Guard got combo-charged by the Acolytes (flank), the Prince (other flank) and the Kraken to the front. The Manticore attempted to charge the big halberd block so as to pin them in place long enough for the kraken to deal with the handgunners and come to help. I failed the 5+ charge though, and my BSB was now staring at some very angry flagellants!! To save the situation, the Yema Acolytes jumped in front of the Steam Tank, to prevent it from falling into the flank of the Manticore on the following turn. Magic saw me cast Crippling Fatigue on the Imperial Guard, both occultism damage spells getting dispelled. Combat started with the imperial guard fight: the Prince challenged the BSB and killed him in the duel, leaving the Kraken and Acolytes free to kill Imperial guard: when the dust settled they had killed enough to deprive the unit of their steadfast, while the elite imperial soldiers couldn’t do much to the kraken in front of them. This forced them to flee, and I elected to pursue with all of the units in the direction of the Acolytes: this brought the Prince and the acolytes into the Handgunner fight, allowing them to fight again! As expected, the handgunners stood no chance now that reinforcements had arrived: they lost enough for my kraken to negate steadfastdied, opening up yet another overrun path for the victors! This time, the Kraken overran into the front of the Halberds, while the Prince and Acolytes fell into the flank. Finally, the Medusa forced the Knights to flee and pursued them off board. And with that (very) successful turn, things were looking up despite the poor positioning of the Manticore! The Steam Tank crushed into my Yema Acolytes and the Flagellants charged the Manticore BSB. With most units in combat, the only other movement was the Reiters who maneuvered around the Blades and the Militia moving to relative safety. In the magic phase I had to dispel the Prelate’s prayers, which led to a fireball dropping the left Blades to 2-strong. 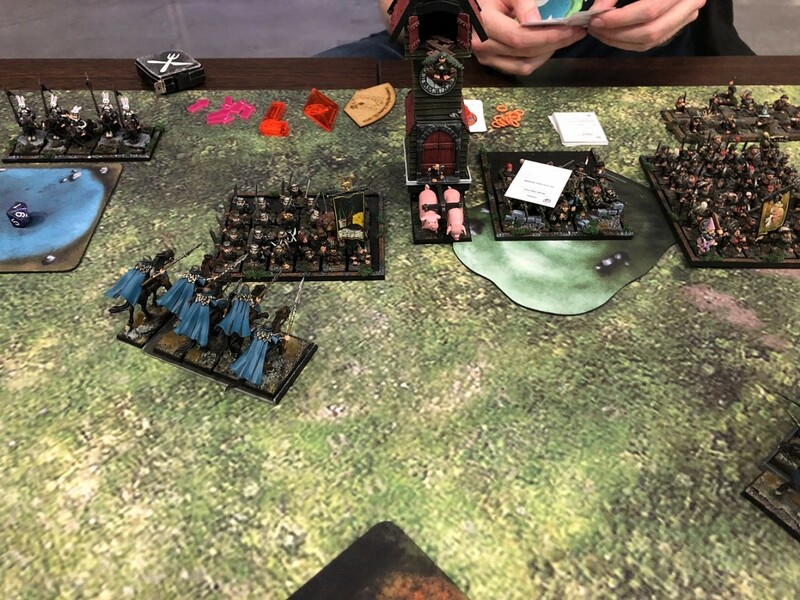 In combat the Steam Tank dealt 3 wounds to the Acolytes for none back, and -much to my dismay- the elves held their ground; this meant that the Tank would get to grind them next turn instead of standing there aimlessly. On the plus side, the Manticore/Flagellant fight went better than I’d expected: the Priest refused my captain’s challenge, then I did an almost perfect roll and killed 7 flagellants out of 8 attacks! The Manticore’s hide proved to be too hard for the flaggies, and so we stuck in combat. In the Halberdier big fight, the acolyte champion fought the unit champ in a duel and killed him, while the rest of the acolytes and Prince killed a bunch of halberdiers and took little to no damage back. The Kraken targeted the Marshall but failed to punch through his armour. The halberds passed their Break test and held their ground. TURN 4 – Dread Elves. The second Kraken fell into the Halberd combat to help break steadfast faster. The Medusa charged the Mortar, and the Blades of nabh to the right fell upon the flagellants. In the magic phase Crippling Fatigue got dispelled, so I cast the Breath of Corruption on the Manticore. That combat went my way: the Prelate challenged and my BSB took the duel, killing him instantly. The Blades went in a killing frenzy and killed 12 flagellants, leaving only 5 alive. In return, the flagellants killed all but two of the witches. The Steam Tank predictably wiped out the acolytes. The mortar died to the Medusa’s attacks and the halberdier/kraken fight went on: this time the Prince took the duel issued by the Marshall and dealt three unsaved wounds, killing him. The combined efforts of the krakens and the acolytes killed around 20 halberdiers and that was enough to break the unit, with both krakens pursuing close to the Flagellant/Manticore fight. The Steam tank came crashing into my BSB’s flank, and the Reiters continued their rampage in my backfield. With the Prelate gone, magic had no effect this turn, but the Reiters managed to finish off the Blades and were dangerously close to my scoring Corsairs. The Tank dealt five wounds with its impacts, but then lady luck smiled upon me: after 3 successful 6+/5++ saves, the Manticore BSB was still alive! The Blades of Nabh and the BSB killed the last remaining Flagellants, but the fanatics took the Blades with them to the grave in return. The BSB held his ground and reformed to face the tank. Both Krakens fell upon the Steam Tank now, while the corsairs still attempted to evade the Reiters. The Prince relocated towards the center, along with the remaining acolytes. In magic the Ice and Fire was dispelled vs the Reiters, allowing me to cast Crippling Fatigue on the Steam Tank. In the ensuing combat the Tank took 4 unsaved wounds, which multiplied to enough to instantly kill it, saving my bsb in the process. 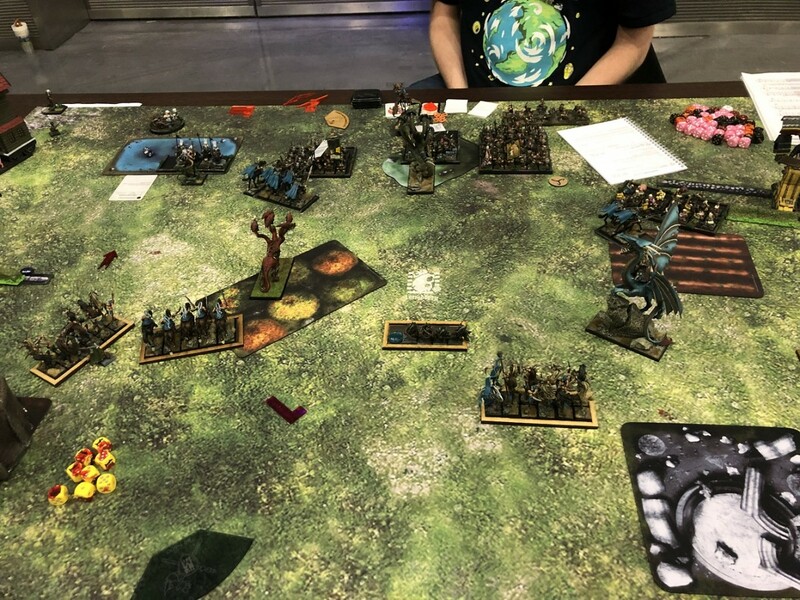 With only the Wizard/Militia and Reiters left, my opponent focused his magic and shooting into killing the last few corsairs: He managed to do that with his last roll of the game, denying me the Spoils token and tying the objective. When all was said and done, the Dread Elves had achieved a 14-6 victory. My team mates all won their games, giving us a big win for the third round! Getting the first turn in this game helped me immensely, allowing me to tie up the majority of the enemy shooting by turn 2 and deal with the imperial units before they could maneuver into a position where they could support one another. 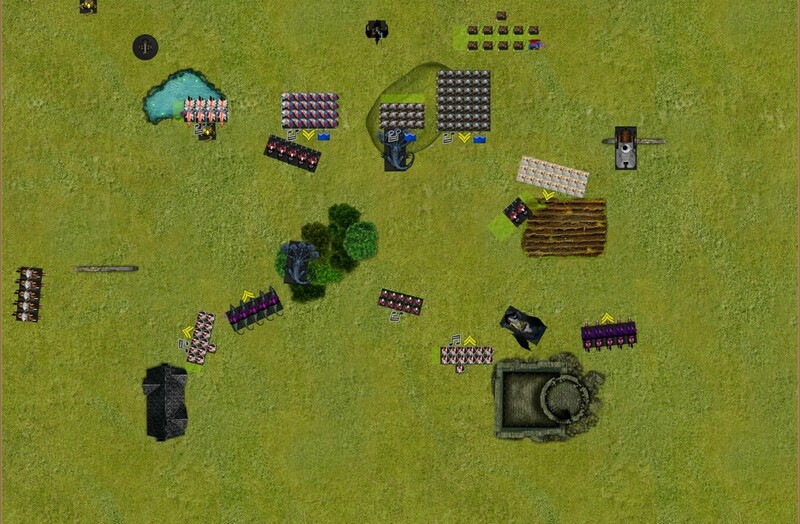 My opponent took every opportunity I gave him, and stayed focused on the objective until the last turn, getting 6 points even after losing almost his entire army. 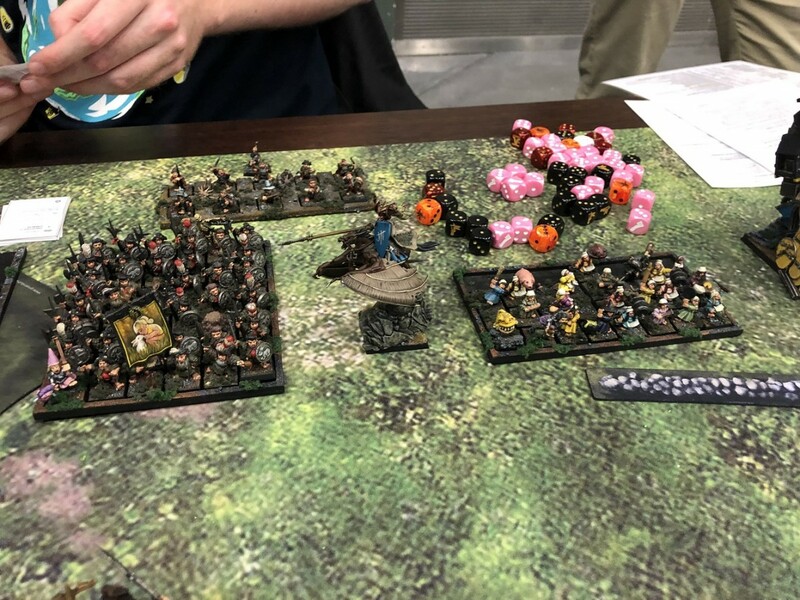 A couple of different rolls (for example, the Manticore’s saves against the Flagellants and the Steam Tank) would have seen my right flank collapse, which is what I feared when the Kraken bounced off the war engine on turn 2. Still, maneuvering around that 12” no-go zone that the Steam Tank projects really limits my options and so I had to take the chance at killing it turn 3: I was expecting the Kraken to do 3-4 wounds on turn 1, survive and strike again to kill it before it coud retaliate. Bas is a great guy to play against, always smiling and we engaged in a lot of banter during our game, making this by far the most relaxing and fun game of the weekend. His army got nominated for best painted, too, and I still think he should have won! So after a very tiresome day, we ended up on top of the scoreboard and were up for two very tough games on Sunday! Next up: Team TGH and Kingdom of Equitaine!